Ah, the ongoing saga of missing episodes. With nearly 100 episodes lost from the archives, it’s always going to be an emotive topic. Just think of how glorious it would be to see the likes of The Daleks Master Plan, Marco Polo, The Faceless Ones, and The Abominable Snowmen after all these years. In fact, we don’t have to imagine that joy: remember what it was like back in 2013 to have The Enemy of the World and The Web of Fear back with us? A wonderful time. That’s why it’s so abhorrent when a fake eBay listing goes up for a missing episode. That’s exactly what happened: earlier this week, a seller put up a listing for Episode One of The Savages. People were immediately (and rightly) suspicious, especially as the images used to “prove” its authenticity were actually John Cura’s telesnaps – from the wrong episode. The seller then amended the sale, claiming he’d got it wrong, that it was Episode Four instead. 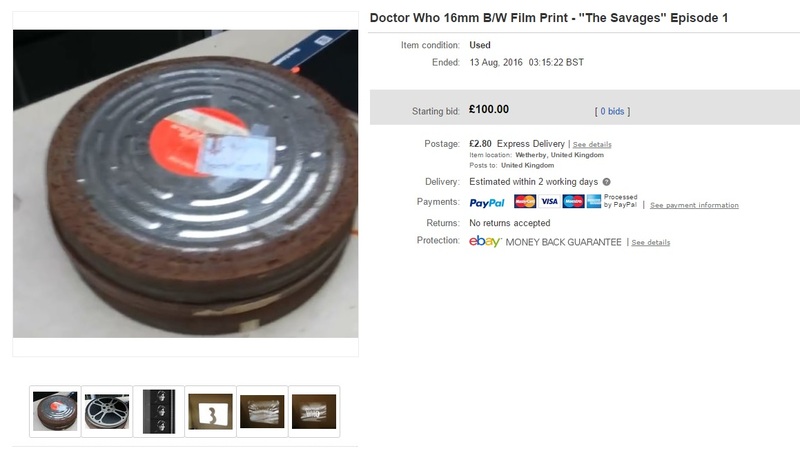 With a starting bid of £100, this was supposedly a 16mm black and white film print, and claimed to be “in watchable condition given the age of the print. This film has come from the collection of a relative who died last year. I do not have a great deal of information about the item other than that it is legal to own and is no longer considered to be the property of the BBC”. People did bid on the item. Indeed, it tallied up quite an astonishing amount of cash, and that’s what I want to address. Because it’s sad they were taken in. There’s a questionable logic at play here on behalf of the seller, who might’ve done it for a laugh, but this is something we care about. Everyone has a passion (or at least should do), and for many, it’s Doctor Who. It’s understandable that some bid on the item; nonetheless, those folk should be more wary in future. Stay sceptical. If you do find something of interest, tell the community. In fact, tell the BBC! That’s what anyone who ever finds a missing episode should do. 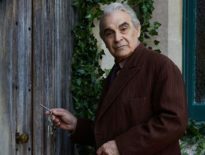 No matter what grievances you may have – with the BBC, with fandom, with whoever – if you find something, alert the BBC. Because we’re an appreciative (mostly) community of dedicated individuals, who would love for even one episode to be returned. The BBC will probably pay pretty well to have that sort of thing back in their archives too: I’ve no proof of that because I’ve never been lucky enough to find a missing serial, but otherwise, Phillip Morris wouldn’t have the money to travel around the world, discovering, for example, rare reels in Nigeria containing The Enemy of the World and The Web of Fear. 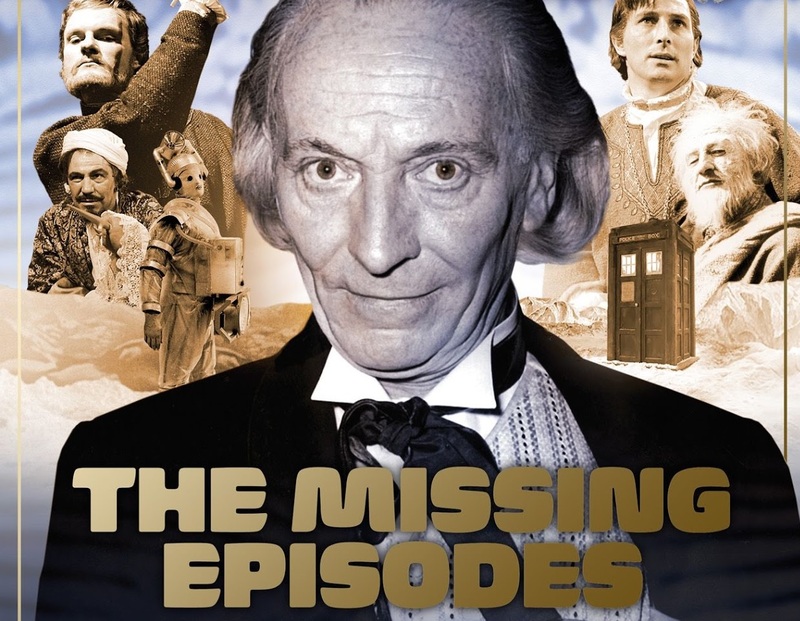 If you find someone selling a missing episode on eBay, question why they’ve not already approached the Beeb. Contact the seller. Tell them the BBC would likely be interested. Maybe they’re not aware of how valuable 1960s Doctor Who stories are. Maybe it’s a fake listing. Sadly, in this case, it was exactly that. A hoax. But I remain hopeful that one day, more shall be returned. 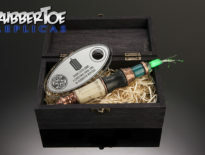 News	Rubbertoe Replicas Sale Ends This Monday!